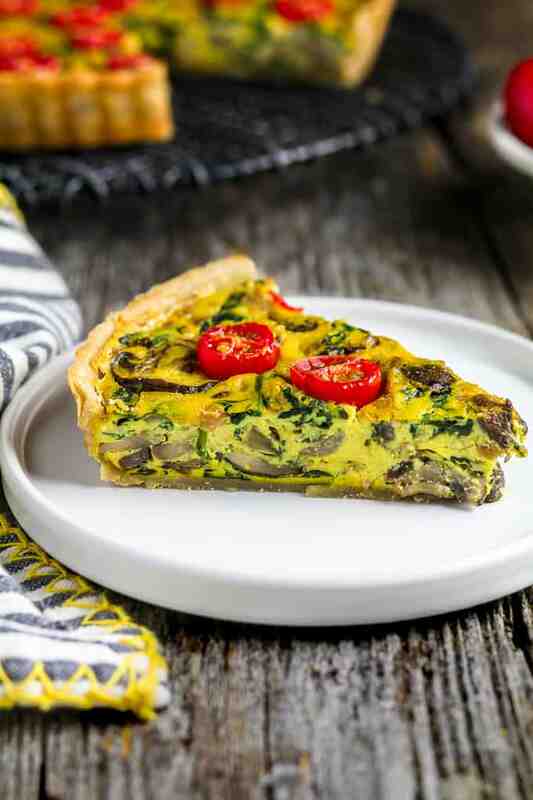 For a winning breakfast or brunch, serve this Easy Vegan Quiche to a hungry crowd. The filling is packed with flavor from sautéed onions, garlic, and browned mushrooms. It calls for a pre-made pie crust to make it easier! We’re having Easter brunch at our house this year and I’m already planning on easy recipes to serve. I like to serve food that is satisfying but won’t keep me in the kitchen for hours. This Vegan Quiche is on the menu along with this Black Bean Corn Salad and Vegan Crab Bites. Plus, fresh OJ for the littles and mimosas for the big kids! YES, Vegan Carrot Cake with Cream Cheese Frosting is on the menu too and I’ll be sharing that recipe soon! I’ve made quiche with tofu before I but wasn’t impressed with the flavor and thought it was dry. I decided to give it another go when I saw this recipe from Genius Kitchen. It’s packed with veggies that provide flavor and subtle moisture. I reduced the non-dairy milk, added tomatoes and more seasoning along with Black Salt (Kala Namak) for that ‘eggy’ flavor! It’s SO GOOD! CAN YOU BUY VEGAN PIE CRUST? YES! Many are vegan by default and some are labeled vegan. Just check the ingredients before you buy. I really like the Pre-Made Vegan Pie Shells from Wholly Wholesome. They are certified vegan and they sell a Gluten-Free version too. You can find them in the freezer section at many mainstream supermarkets. If you can’t find a pre-made pie shell, you can use store-bought rolled pie crust. Many are also vegan by default and usually found in the freezer section. Just follow package instructions for preparation. If you go with the rolled crust, you will need a 9-inch Pie Pan or Tart Pan. You can also make a homemade pie crust if you’d like. 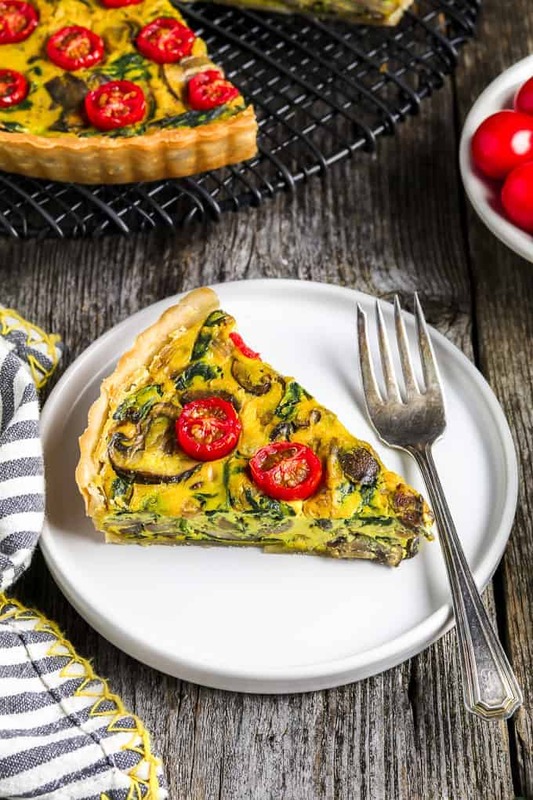 HOW TO MAKE VEGAN QUICHE? Sauté onions until softened and lightly browned. Add garlic and sauté until lightly golden and fragrant. Now add mushrooms and sauté until softened and browned. Add spinach and cook until just wilted. Sprinkle with salt & pepper if desired and remove from heat. Break up tofu and add it to a Food Processor along with the seasonings, 1 tablespoon of milk, and flour. Process until the mixture is smooth. It will be very thick, but if it won’t smooth out, you can add 1 more tablespoon of milk – just enough to get in moving. Place quiche filling into a medium mixing bowl and fold in the mushroom/spinach mixture. Add the filling to the pie crust and spread out evenly with a spatula. Place the cut tomatoes on top and bake in the oven for 30-40 minutes until the filling firms up and is golden on top. Remove from oven and let cool for 10 minutes before cutting. 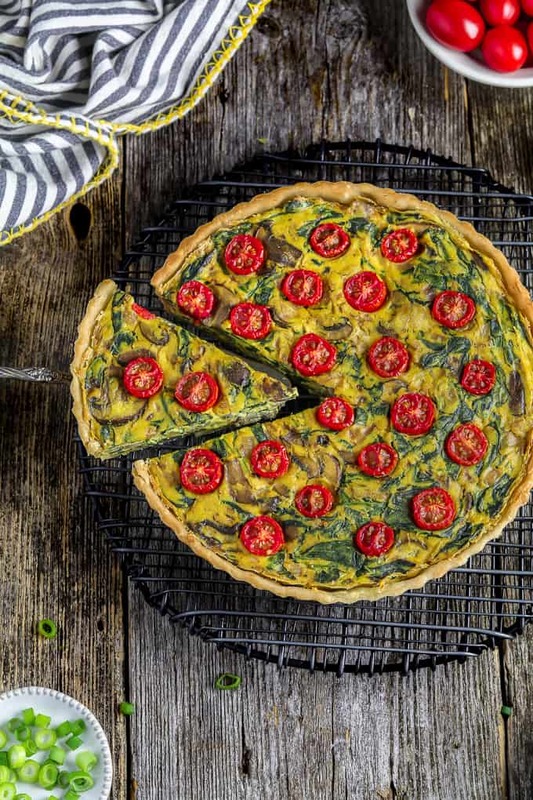 CAN I MAKE THIS VEGAN QUICHE IN ADVANCE? Yes! 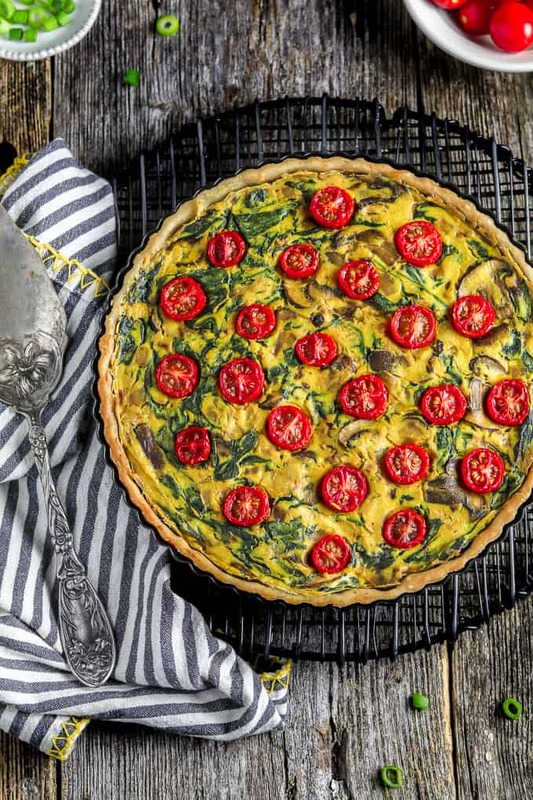 You can fully bake the quiche and refrigerate after it has cooled (keep it covered). Then you can reheat in the oven at 350 degrees F for 30-40 minutes. Also, if you want to make it fresh that day, just prepare it up until the baking step and refrigerate until ready to bake. Then follow baking instructions in the recipe. DO I NEED TO PRESS THE TOFU FOR VEGAN QUICHE? I suggest pressing the tofu for at least 20 minutes because I felt the filling was a little too soft and not as flavorful when it wasn’t pressed. You can press it while you’re prepping and sautéing the vegetables to save time. It’s easy! Just wrap a block of tofu in a few paper towels and place it on a rimmed plate. Add a cast iron skillet on top (or something equally heavy) and let it drain for 20-30 minutes. I have a Tofu Press which makes the whole process even easier, but it’s not necessary. 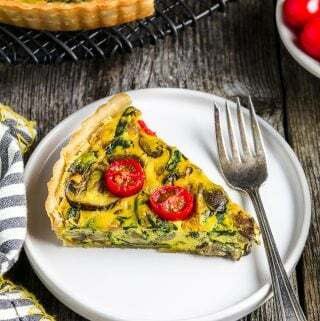 If you make this Vegan Quiche, let me know what you think by ★ star rating it and leaving a comment below. It would really make my day. You can also follow me on Instagram and share your creation with me. Just tag me @veganhuggs and hashtag #veganhuggs so I don’t miss it. Heat oil in a large skillet over medium heat. Add onions and sauté for 3-5 minutes until softened and lightly browned. Add garlic and sauté for 30-60 seconds until lightly golden and fragrant. Now add mushrooms and sauté until softened and browned. About 5-7 minutes. Add spinach and cook until just wilted, about 1-3 minutes. Sprinkle with salt & pepper if desired. Remove from heat and set aside. Break up the tofu and add it to a food processor along with the seasonings, 1 tablespoon of milk, and flour. Process until the mixture is smooth, about 2 minutes. It will be very thick, but if it's too thick and won't smooth out, you can add 1 more tablespoon of milk. Just enough to get in moving. 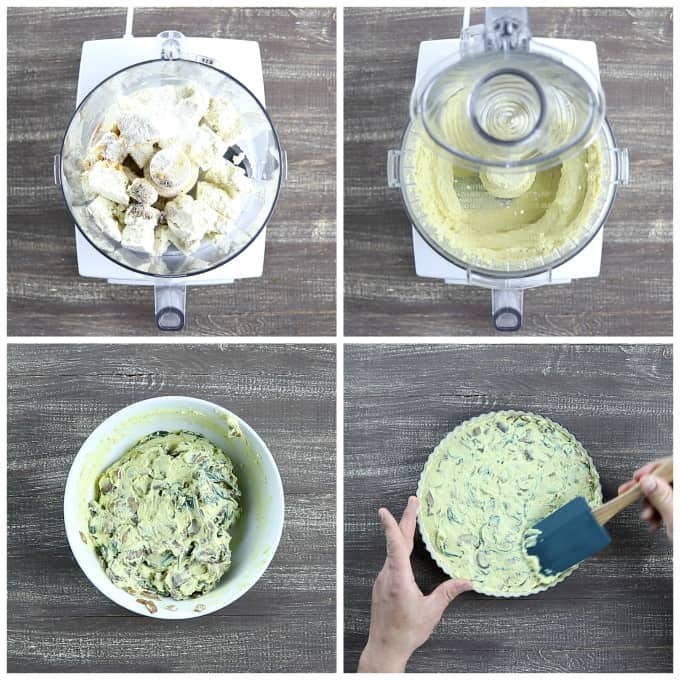 Using a spatula, scrape the mixture out of the container into a medium mixing bowl. 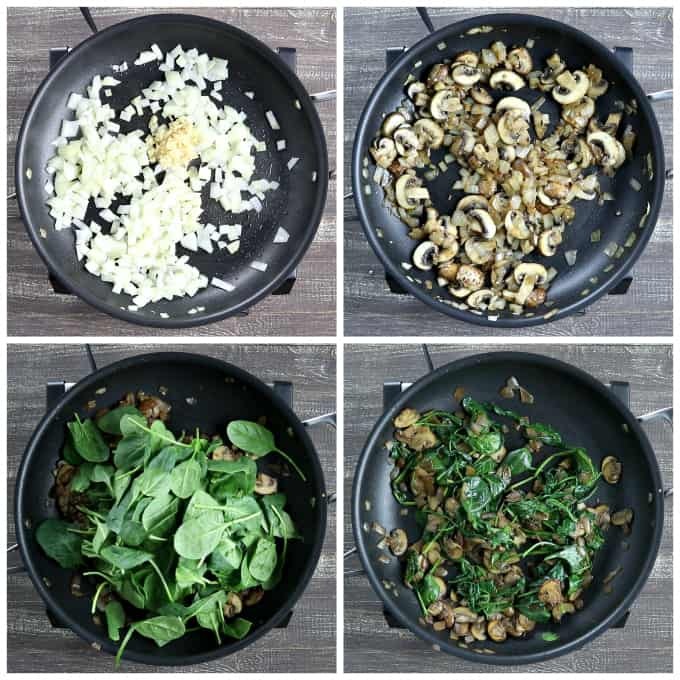 Fold in the mushrooms/spinach mixture and combine well. Place the mixture in the pie crust and spread evenly. Add the cut tomatoes on top and gently press down so they are slightly in the mixture. Bake in the oven for 30-40 minutes until the quiche firms up and is golden on top. Remove from oven and let cool for 10 minutes before cutting. * BLACK SALT: it adds a subtle 'eggy' smell and flavor to the quiche. I highly recommend trying it at least once. If you're not into 'eggy' flavor, you can just use regular salt instead. It will still be delicious! * PRESSING TOFU: wrap a block of tofu in a few paper towels and place it on a rimmed plate. Add a cast iron skillet on top (or something equally heavy) and let it drain for 20-30 minutes. I have a Tofu Press which makes it easier. * Adapted from Genius Kitchen. oh hey! I cant wait to make this for the family.on Saturday morning. Can I leave out the spinach and just add more mushrooms?